It’s so nice to be home. After a month of travel it is so nice to be settled again. Of course in 2 weeks time I will be all ready to get back on a plane, but for now I’m just really glad to not have to live out of a suitcase. Believe it or not there are still some loose ends from Puerto Vallarta, which I will get to tomorrow. Then I can start cooking again and sharing recipes with y’all. Of all the food I’ve eaten in the last month, the thing that has stuck in my head the most are cinnamon rolls. So I’m going to start baking tomorrow, if anyone who is reading this has an amazing cinnamon roll recipe please let me know. The last thing I wanted to say about Toronto is: Caesar. Which is the Canadian version of a Bloody Mary only instead of being made with tomato juice it is made with Clamato juice. Something that you can not find here (or at least not easily) but can make by adding clam juice to tomato juice (50/50 but obviously you can adjust as you see fit). The rim of the glass is coated with celery salt. It’s odd that I have posted now 3 times in as many weeks about Bloody Mary’s and now a variation as I really am mostly just a wine drinker and I am not much of a fan of drinking before 5. Being on the road means you are often out for brunch/lunch and particularly around the holidays when everyone is being festive, or at least trying to be festive, a nice bright red drink festooned with pickled onions, celery, pickles, olives, cherry tomatoes, lime wedges and the variations go on….seemed like a great way to start my day. My only word of warning is 2 Caesars/Bloody Mary’s is 1 to many! That is if you have any intention of doing anything more that afternoon than going back to your hotel room and napping. Of course that is just advice from a lightweight. The funny thing is how in Puerto Vallarta Clamato juice is sold everywhere, which just goes to prove what I have always said about it, which is that the Canadians outnumber the Mexicans in Puerto Vallarta. Darling I love you but give me Park Avenue! So nice to be home. 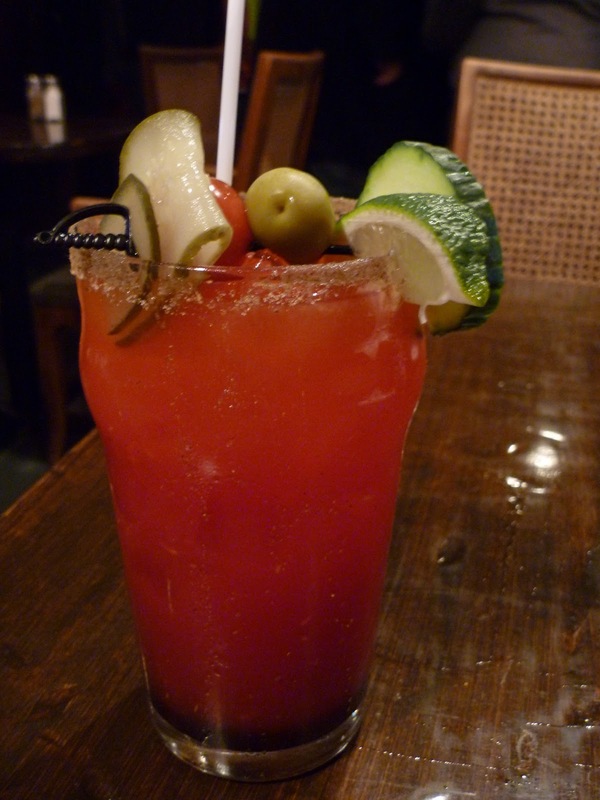 This entry was posted in Recipes, Travel and tagged Canada, Ceasar Cocktail, Clamato Juice. Bookmark the permalink.